Edward Bransfield (c. 1785 – 31 October 1852) was an Irish sailor who rose to become an officer in the British Royal Navy, serving as a master on several ships, after being impressed into service at the age of 18 in Ireland. He is noted for exploring parts of Antarctica, sighting the Trinity Peninsula in January 1820. Edward Bransfield was born in Ballinacurra, County Cork, Ireland, in c.1785. While little is known of Edward's family or early life, the Bransfields were thought to have been a well-known and respected Catholic family. The Bransfields may have had enough money to pay for Edward's education, but because of the Penal Laws, it is more likely that he attended a local hedge school. On 2 June 1803, Bransfield, then eighteen years old, was removed by British sailors from his father's fishing boat and impressed into the Royal Navy. He began as an ordinary seaman on the 110-gun first rate ship of the line HMS Ville de Paris, where he shared living quarters with William Edward Parry, then a twelve-year-old midshipman. He later also became known in Polar exploration. Bransfield was rated as an able seaman in 1805 and was appointed to the 110-gun first rate HMS Royal Sovereign (which had taken part in the battle of Trafalgar in 1805); he was promoted in 1806 to able seaman, then 2nd master's mate in 1808, midshipman in 1808, clerk in 1809, and midshipman again in 1811. By 1812 he had achieved the rank of second master, and in the same year he was made acting master on HMS Goldfinch, a 10-gun Cherokee-class brig-sloop. Between the years 1814 and 1816, he served briefly, as master on many fifth rate ships. On 21 February 1816, he was appointed master of the 50-gun fourth rate HMS Severn, leading it in the Bombardment of Algiers. During September 1817, he was appointed master of HMS Andromache under the command of Captain W H Shirreff. It was during this tour of duty that he was posted to the Royal Navy's new Pacific Squadron off Valparaíso in Chile. During 1773 James Cook sailed beyond the Antarctic Circle – noting with pride in his journal that he was "undoubtedly the first that ever crossed that line.". The next year, he circumnavigated Antarctica completely and reached a latitude of 71° 10', before being driven back by the ice. It was the furthest south any European man had ever travelled. Although Cook failed to see Antarctica, he dispelled once and for all the myth that a fertile, populous continent surrounded the South Pole. Not surprisingly, the British Admiralty lost interest in the Antarctic and turned its attention to the ongoing search for the Northwest Passage. Almost half a century passed before anyone else is known to have travelled as far south as Cook. During 1819 while rounding Cape Horn, William Smith, the owner and skipper of an English merchant ship, the Williams, was driven south by adverse winds and discovered what came to be known as the South Shetland Islands. When news of his discovery reached Valparaíso, Captain Shirreff of the Royal Navy decided that the matter warranted further investigation. He chartered the Williams and appointed Bransfield, two midshipmen, and the surgeon from the ship HMS Slaney, to survey the newly-discovered islands. Smith remained aboard, acting as Bransfield's pilot. After a brief and uneventful voyage into the Southern Ocean, Bransfield and Smith reached the South Shetland Islands. Bransfield landed on King George Island and took formal possession on behalf of King George III (who had died the day before on 29 January 1820). He proceeded in a south-westerly direction past Deception Island, not investigating or charting it. 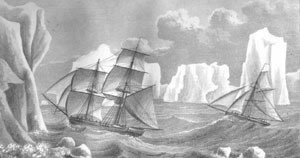 Turning south, he crossed what is now known as the Bransfield Strait (named for him by James Weddell in 1822), and on 30 January 1820 sighted Trinity Peninsula, the northernmost point of the Antarctic mainland. "Such was the discovery of Antarctica," writes the English writer Roland Huntford. Unknown to Bransfield, two days earlier, 28 January 1820, the Russian explorer Fabian Gottlieb von Bellingshausen may have caught sight of an icy shoreline now known to have been part of East Antarctica. On the basis of this sighting and the co-ordinates given in his log-book, Bellingshausen has been credited by some (e.g., the British polar historian A. G. E. Jones) with the discovery of the continent. Bransfield made a note in his log of two "high mountains, covered with snow", one of which was subsequently named Mount Bransfield by Dumont D'Urville in his honour. Having charted a segment of the Trinity Peninsula, Bransfield followed the edge of the icesheet in a north-easterly direction and discovered various points on Elephant Island and Clarence Island, which he also formally claimed for the British Crown. He did not sail around Elephant Island and did not name it (it is named for elephant seals), although he charted Clarence Island completely. When Bransfield returned to Valparaíso, he gave his charts and journal to Captain Shirreff, who delivered them to the Admiralty. The original charts are still in the possession of the Hydrographic department in Taunton, Somerset, but Bransfield's journal has been lost. The Admiralty, it seems, was still more interested in the search for the Northwest Passage. But, two private accounts of Bransfield's historic voyage were published during 1821. During recent years the journal of one of the midshipmen, Charles Poynter, was discovered in New Zealand. An account has been published by the Hakluyt Society, edited by Richard Campbell, RN. The remainder of Edward Bransfield's life was obscure. He died on 31 October 1852 in his sixty-seventh year and was buried in Brighton, England. His wife survived him and was buried in the same grave after her death in 1863. Bransfield Island, Bransfield Strait, Bransfield Trough, Bransfield Rocks and Mount Bransfield were all named in his honour. During 2000 the Royal Mail issued a commemorative stamp in Bransfield's honour, but as no likeness of him could be found, the stamp depicted instead RRS Bransfield, an Antarctic surveying vessel named after him. In 1999 Edward Bransfield's grave, discovered in a deteriorated state in a Brighton churchyard, was renovated (funded by charitable donations) by Sheila Bransfield. In 2002 she completed a master's thesis on his role in the discovery of Antarctica at the Greenwich Maritime Institute. The event was marked by a ceremony attended by numerous dignitaries. ^ Michael Smith, Great Endeavour: Ireland's Antarctic Explorers, Dublin: The Collins Press, 2010, p. 10. ^ Michael Smith, Great Endeavour: Ireland's Antarctic Explorers, Dublin: The Collins Press, 2010, p. 12. ^ Flavley, Pat. "Edward Bransfield". Beyond Endurance. Archived from the original on 23 July 2012. Retrieved 1 August 2011. Huntford, Roland (1985). The Last Place on Earth. Pan Books Ltd., London. ISBN 0-330-28816-4. The Antarctic Problem: An Historical and Political Study (George Allen & Unwin, London 1951), E W Hunter Christie. Below the Convergence: Voyages Towards Antarctica 1699–1839 (W W Norton Co Ltd, London, 1977), Alan Gurney. Ф. Ф. Беллингсгаузен. «Двукратные изыскания в южнополярном океане и плавание вокруг света». By Imperial Decree, St Petersburg, 1831, two vols. The South Shetland Islands are a group of Antarctic islands with a total area of 3,687 square kilometres (1,424 sq mi). They lie about 120 kilometres (75 mi) north of the Antarctic Peninsula, and between 430 kilometres (270 mi) to 900 kilometres (560 mi) south-west from the nearest point of the South Orkney Islands. By the Antarctic Treaty of 1959, the islands' sovereignty is neither recognized nor disputed by the signatories and they are free for use by any signatory for non-military purposes. Livingston Island is an Antarctic island, part of the South Shetlands Archipelago in the Southern Ocean. It was the first land discovered south of 60° south latitude in 1819, a historic event that marked the end of a centuries-long pursuit of the mythical Terra Australis Incognita and the beginning of the exploration and utilization of real Antarctica. The name Livingston, although of unknown derivation, has been well established in international usage since the early 1820s. William Smith was the English captain born in Blyth, Northumberland, who discovered the South Shetland Islands, an archipelago off the Graham Land in Antarctica. His discovery was the first ever made south of 60° south latitude, in the present Antarctic Treaty area. Trinity Peninsula is the northernmost part of the Antarctic Peninsula. It extends northeastward for about 130 km to Cape Dubouzet from an imaginary line connecting Cape Kater on the north-west coast and Cape Longing on the south-east coast. Prime Head is the northernmost point of this peninsula. Some 20 kilometers southeast of Prime Head is Hope Bay with the year-round Argentinian Esperanza Base. Greenwich Island is an island 24 km (15 mi) long and from 0.80 to 9.66 km wide, lying between Robert Island and Livingston Island in the South Shetland Islands. Surface area 142.7 square kilometres (55.1 sq mi). The name Greenwich Island dates back to at least 1821 and is now established in international usage. Bransfield Strait is a body of water about 100 kilometres (60 mi) wide extending for 300 miles (500 km) in a general northeast – southwest direction between the South Shetland Islands and the Antarctic Peninsula. Start Point is a point marking the northwest end of Byers Peninsula, Livingston Island in the South Shetland Islands, Antarctica and forming the southwest side of the entrance to Svishtov Cove and the northeast side of the entrance to the New Plymouth bay. Discovered by Edward Bransfield in January 1820, and so named by him because of its resemblance to a point on the south coast of England by the same name and because it was the place where his operations began. Shirreff Cove is a small cove or anchorage, situated immediately southwest of Cape Shirreff between San Telmo Island and Gerlovo Beach on the northwest side of Ioannes Paulus II Peninsula, Livingston Island in the South Shetland Islands, Antarctica. Cape Shirreff is a prominent cape at the north end of the rocky peninsula which separates Hero Bay and Barclay Bay on the north coast of Livingston Island, in the South Shetland Islands of Antarctica. The cape was named by Edward Bransfield in 1820 after Captain William H. Shirreff, the British commanding officer in the Pacific at that time. Hurd Peninsula lies between South Bay and False Bay on the south coast of Livingston Island in the South Shetland Islands, Antarctica. The Spanish Juan Carlos I Antarctic Base and the Bulgarian St. Kliment Ohridski Base are situated on its west coast. San Telmo Island is an island forming the west side of Shirreff Cove on the north-west coast of Ioannes Paulus II Peninsula, Livingston Island in the South Shetland Islands of Antarctica. It has a surface area of 22 hectares. Blythe Bay is an anchorage at the southeast side of Desolation Island, lying north of Livingston Island in the South Shetland Islands, Antarctica. The bay is bounded by Craggy Island to the northeast, Desolation Island to the northwest, the Miladinovi Islets to the west and Wood Island to the south. Mercury Bluff is a perpendicular bluff on Gerlovo Beach in the northwest of Ioannes Paulus II Peninsula, Livingston Island in the South Shetland Islands, Antarctica. The area was visited by early 19th century sealers. Frederick Rocks is a group of rocks lying in Barclay Bay on the north side of Livingston Island in the South Shetland Islands, Antarctica. The area was visited by early 19th century sealers operating on nearby Byers Peninsula.